Our spacious nearly 1600 sq ft condo is one of the closest units to the cabriolet (see photo from unit's kitchen window to view gondola just a few minutes walk away). Our condo is an end unit with only one shared wall. Remodeled for the 2017 ski season with a new private hot tub, all furnishings, new fireplace, lighting and more. (Photos of remodel will be coming!) The unit also features vaulted ceilings, flat screen TVs, wireless high speed internet, and more. This condo is complete with a private patio and mountain views. The complex features common area sauna and hot tub year round, common area pool and tennis courts-Summer Only. 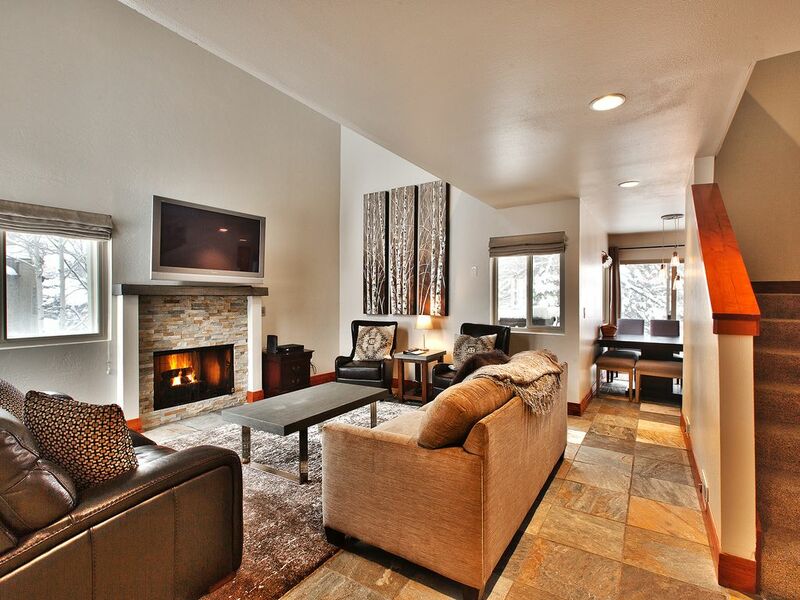 Hidden Creek is located on the Free Shuttle Route to downtown Park City and the Park City and Deer Valley Ski Resorts. The complex is adjacent to the world famous Golden Door Spa. Owner is a licensed real estate agent with Engel & Voelkers Park City. Hi we're the Ponder family. We've owned this condo since 1996 when we used to live in Park City. My husband and I met in Park City and got engaged there (at the Riverhorse Restaurant). Though life demands have taken us to Chicago, we kept this condo for our love of Park City and all our great friends still there. We come back many times each year, and have introduced our girls to our love of Park City and all it has to offer. We hope you will enjoy our family condo! Location, location, location!!! We love that our condo is one of the closest to the cabriolet, and as the Canyons continues to build up its services, it has become an amazing vacation destination. We also use the condo as a family frequently, and have made every update with that in mind. We renovated our condo over the last few years with our family use in mind, and find its features and proximity to the Canyons, overall family environment of the area perfect for our young girls (my youngest was 2 1/2 and able to walk to the cabriolet in ski boots!). Unique to this unit is a large outdoor area out the back door, perfect for snowplay that can be supervised from the kitchen table!. We also like the loft area for the kids to play, leaving the family area for the adults. New championship golf course under construction that wraps around condo, scheduled to be open spring/summer 2014. (2) Brand new flat screen TV. Half a dozen DVDs for you to enjoy. Loft area ideal for kids to spread out separate from common living area. Great place and great location. Easy to get the kids ready at the condo and head out for the day. Amazing stay! The house was super close to the lifts, clean, convenient and as advertised. I would definitely stay here again. We loved our stay at Julie's Condo. We had 4 couples and everyone was very comfortable throughout the entire stay. The Hot Tub is spectacular for those Apres Ski pains and the location is approx 300 paces to the Cabriolet lift. We look forward to coming back in the future. We stayed at this property for a long Sundance weekend. Not only was the unit spotless, but it had everything we needed. Fireplace, Hut tub, plenty of bedrooms, etc. In addition, the location proved perfect. It's a really short walk to the Cabriolet lift, 7-11 and the free Park City buses. Lastly, Julie, the owner, was wonderful to deal with and is easily the best VRBO host I've ever had. We had a great spring break ski vacation! We loved the layout of the space and it was an updated, nice decor, and located so close to the Cabriolet lift. We rented and stored our skis at Aloha rental in the Canyons Plaza which is convenient to the lifts. After skiing, the hot tub at the unit was quite a treat for our sore muscles. We drove our rental car to nearby grocery stores, Park City Main Street shopping and dining, sledding and cooked breakfast each morning and other meals at the condo in the well equipped kitchen. It was a great set up for us and 3 college aged guys and we had room to spare! We had a blast at my team’s offsite. Right across from lift, couldn’t be more convenient. We ate out but plenty of kitchen gear for breakfast. The hot tub was a nice plus as well. Tks Julie! Once payment is received to hold the reservation, and if reservations are canceled 60 days or more before arrival, a full refund will be given. Canceling 30 to 59 days before scheduled arrival will result in a $200 charge. Cancellation less than 30 days prior will not be eligible for a refund.